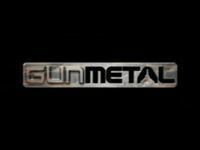 Gun Metal is a 3-D shooting game, released in 2002, for the Xbox and PC by the now defunct Rage Software Limited. The lead artist Nick Tipping and lead programmer Mark Featherstone on Gun Metal went on to form Moonpod. Gun Metal allows players to pilot a futuristic mech which can transform into a plane. The game is based around a war (sometime in the future) on a planet called Helios, where humans have settled. Enemy spacecraft have followed them from Earth and are attempting to exterminate the colony. Project Gunmetal is a massive operation which oversaw the creation of a supremely powerful war machine. In its primary form, a walking "humanoid" mech many dozens of feet high, it possesses a range of 12 weapons and an electronic shield. At the push of a button, it transforms into an advanced fighter jet reminiscent of a modern fighter jet. It also possesses 12 weapons, ranging from napalm, pulse cannons, harpoons and rockets. Source: Wikipedia, "Gun Metal (video game)", available under the CC-BY-SA License.